We have complete range of Ophthalmic Teaching & Training Devices like Phaco Parctice Eyes, Model Eye for Indirect Ophthlmoscopy and Retinoscopy, Laser Practice Eyes and Eye Ball Stand. 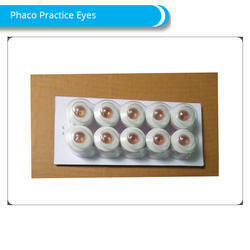 Our company is a prime manufacturer, exporter, importer, trader and supplier of an excellent assortment of Phaco Practice Eyes. 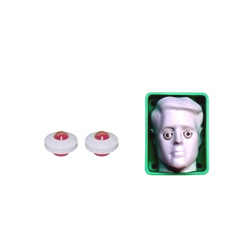 Used for practicing the basic steps of phaco surgery, these practice eyes are made by using quality material keeping in mind the quality norms. The provided practice eye is used for practicing the basic steps of phaco surgery and getting good hand foot coordination on the phaco machines with minimum stress levels. Lasers in ophthalmology can be disastrous if not used properly. The greatest impediment in teaching Lasers is the potential danger to the patient's eye during the intial learning. 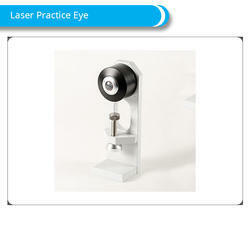 To overcome this problem, a Laser Practice Eye “Laser-i” was developed. “Laser-i” is an Ophthalmic Teaching Device used for simulating Green/Red Laser shots in an artificial diseased retina. The optics resembles an aphakic, emetropic eye. A photographic film is used as an artificial diseased retina, which responds to the laser shots. Under exposure / correct exposure and over exposure gives a different visible reaction. 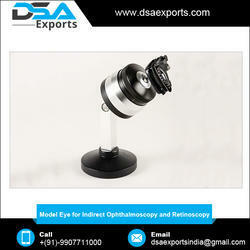 It can be mounted on Slit Lamp of all available makes. “Laser-i” is an optical + mechanical device which does not require electricity. With several years of experience in this domain, we are providing our clients superior quality Laser Practice Eyes. A photographic film is used as an artificial diseased retina, which responds to the laser shots. Also, these practice eyes can be mounted on slit lamp of all available makes & provided in finest packaging options for ensure its quality. The offered practice eyes are checked by quality controllers so as to deliver a defect free range from our end. The optics resembles an aphakic, emetropic eye. A photographic film is used as an artificial diseased retina, which responds to the laser shots. Under exposure / correct exposure and over exposure gives a different visible reaction. 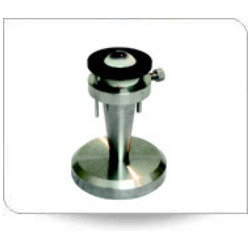 It can be mounted on Slit Lamp of all available makes. “Laser-i” is an optical + mechanical device which does not require electricity. For treatment of Lazy / Amblyopic eye. Based on the concept of active and controlled stimulation. All day passive occulusion replaced by seven-minute active stimulation. Compact, portable model which can be given to the patient saving time and helping in regular exercise. Size : 21 x 14 x 11 cm. Slide Size (Dia): 10.0 cm. 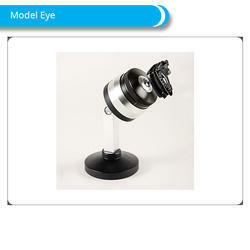 The policy made by our firm makes us betrothed in providing well tested CAM Vision Stimulator. Our offered vision stimulator is compact, portable model which can be given to the patient saving time and helping in regular exercise. The provided vision stimulator is accessible from us on several sizes & other specifications as per the variegated demand of clientele. As well, these vision stimulators can be availed from us at market leading price within promised time frame. With the help of our distinguished professionals, we are offering a commendable range of Indirect Ophthalmoscopy Retinoscopy Model Eye. The offered model eye has ability to hypermetropic eyes & stimulate myopic & also used for practice of indirect ophthalmoscopy and retinoscopy. Also, our model eye is checked from our side before supplying to customer’s end. 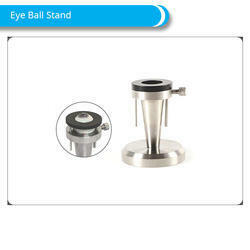 This model eye is available with us in diverse sizes and other specifications to meet the specific requirements of customers. Intended Use: For micro-surgical training on human or animal eyes. For cutting a full/partial thickness donor button from intact globe. 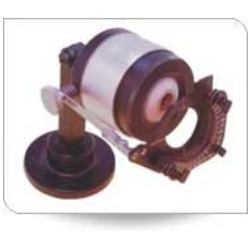 Sterilization: This device can be sterilized by autoclaving or ethylene oxide. For practice of indirect ophthalmoscopy and retinoscopy. Can simulate myopic as well as hypermetropic eyes. Astigmatism can be simulated by inserting cylindrical lens in the trial frame. Looking for Ophthalmic Teaching Devices ?